The Duke and Duchess of Sussex have already raised eyebrows with their tactile displays of public affection. 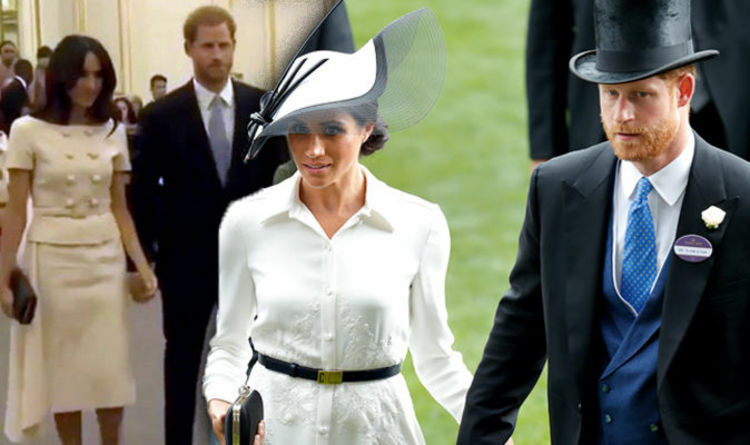 Now eagle-eyed royal watchers have also spotted Harry walking slightly in front of his wife during public engagements - and according to one expert, it demonstrates the couple's deep respect for the monarchy. The newlyweds have barely left each other's sides during their 16-day Pacific tour, but whether they're holding hands or simply walking side-by-side, Harry has consistently taken the lead. Etiquette expert William Hanson told MailOnline: 'It is standard practice for British royalty to allow the "blood royal" to walk or stand a few paces in front of the royalty who has married in to the family, as with HM The Queen and HRH The Duke of Edinburgh and TRH The Duke and Duchess of Sussex. The couple stuck to this protocol for their first engagement in Sydney, after touching down in Australia last week. Harry walked several paces in front of his pregnant wife during their visit to Cockatoo Island, Fiji's Grand Pacific Hotel, and at the University of Suva on Wednesday. They were similarly joined at the hip in Tonga on Thursday, with Harry once again walking in front of Meghan. It is a protocol observed by other royal couples, with the Queen routinely walking in front of the Duke of Edinburgh, while the Duchess of Cambridge is often seen trailing behind husband William.